I have a variety of customized wiring diagrams drawn out by hand (very messily) on some loose leaf. It would probably be beneficial to draw some up and explain them. I find that most inexperienced mechanics who want to work on their bikes are scared of two things; carb work, and electric work. In reality neither of them is very difficult. My carb guide has been helping people out, I’ll try to write up something similar for diagnosing and modifying electrics. But to answer your question directly, I don’t at this time have a diagram of my XS1100 wiring to share with you. hey.. just got a 79(touring). initially it would light the running lights but start intermittently. i could start it by shorting the solenoid or sometimes it worked. now it lights nothing and will only run when the solenoid is started. any suggestions… is there a way to test the solenoid. somebody said maybe the ballast resistor? The first thing I always check when trying to diagnose intermittent electrical problems is the main grounding cable from the battery to the frame. Since you can jump your solenoid this likely isn’t the case, but is a good tip none-the-less. You’re just going to have to take a multi-meter and trace the power up through the starter switch and down to the solenoid – if the solenoid is getting juice and not jumping then it’s the solenoid – if the start button isn’t sending juice down to the solenoid then you just have to work backwards from there. Also, make sure your battery is fresh and your fuses are good and clean. Easy stuff first!! Good luck with it. Wiring problems are rewarding when sorted out. Evan. A few people have told me what you did wouldn’t work because of all the relays, shutoff switches, and igniters, etc. I am one of the inexperienced guys you were talking about. I have a simple chopper diagram i got from a guy if i wired the bike like that would it work? I have the xs1100 (82 or 83 someone gave it to me) that was only made for one year I don’t know if that makes it different. I asked you quite a bit ago if you had a drawing of the abreviated wiring diagram for the xs1100 and you had said it was only drawn out by hand, do you have a copy of that diagram? If so could I get a copy? now I can’t get the darn bike to run, no ignition. I have been probing this bike ALL OVER. I ought to just re-wire the whole bike. PLEASE HELP ME!!! 04 yamaha 1100 silverado. Bright lights and good battery voltage. When you push the start button everything dies. After a few minutes, everything comes back again, but dies when you try to start. Sounds like you have a bad ground or a short. Check the connections at the battery terminals, the main ground connection at the frame, and the wires going too and from the starter and starter solenoid. I have an engine and wiring harness from an 82 xj 1100 that I am outting in my sons pulling tractor. I need HELP with the electronics. I have power and can turn it over but getting fire is another story. I am not sure I even have everything on their that I should. Can you help me?? 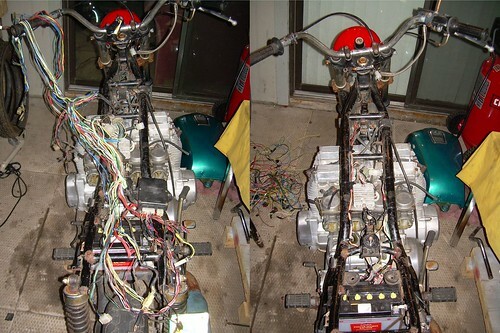 hey man i have an 82 xj1100 that the wiring harness burned up on so i wus thinking its a good time to bob it out like i have been wanting to do is there any way you can send me a diagram of your wiring on the XS i’m just looking for what it takes to make the bike run. can you help me please!! When you hit the start and everything dies, you most likely have a bad battery. MY 04 had the same problem. The battery voltage was good, but it shorts under the start load. I need help! how do I start the yamaha xs1100 engine, if I am missing ignition unit box.Is it possible to run the engine withaut it? Hey I have the 80 xs11 and I am trying to completely remake my wiring harness. I have tried several different diagrams and methods but non of them had worked. The furthest iv’e gotten is having it idle when the solenoid is bridged, but the starter wont ever disengage. I am just looking for a diagram that would get it running mechanically sound. Please help in any way possible, people look at me like I’m crazy when i say it runs. i have a 1978 wire harness im trying to put on my 1981 midnight special, the wires are melted in some spots but they seem to still be ok. i dont need lights or anything i just need spark but i cant figure out why it wont get spark, right now it just looks like a mad tangle of wires that is very confusing i want to know what wires i need just for the engine to run (the reserve lighting box looks like it is badly melted) but do i need that for spark? Maybe an old post but if you had a simplified xs1100 wiring diagram it would be greatly appreciated I am building a xs11 cafe racer. If not I’m sure I can figure it out thanks, Robert. Bonjour,pour ma part, et malgrÃ© l&oi217;applicat8#n de cette solution, la synchro n’aboutissait pas.En regardant dans Comptes et Synchro > Google > Synchroniser Agendas, je me suis aperÃ§u que la synchro n’avait pas Ã©tÃ© faite depuis une semaine, date Ã laquelle j’avais installÃ© des applications qui saturaient la mÃ©moire.En dÃ©sinstallant quelques applis pour libÃ©rer la mÃ©moire, la synchro est repartie.Voilou. Magnificent goods from you, man. I’ve understand your stuff previous to and you are simply extremely fantastic. I really like what you have bought here, really like what you’re stating and the way in which by which you assert it. You make it enjoyable and you continue to take care of to stay it sensible. I can’t wait to read much more from you. That is really a terrific website. Nice change from your usual format. I have read “Love in the Time of Cholera, which I borrowed”. After reading the quotes, i need to buy my first copy. Though I know, after reading it , I would say, “The reflection has changed a bit”, since then. have you had any time to make a wiring diagram for this?